I'm a bit of a tomboy, so when I hear the word "Etiquette," I think of the scene from "A League of their Own" where the girls are practicing being "ladies." 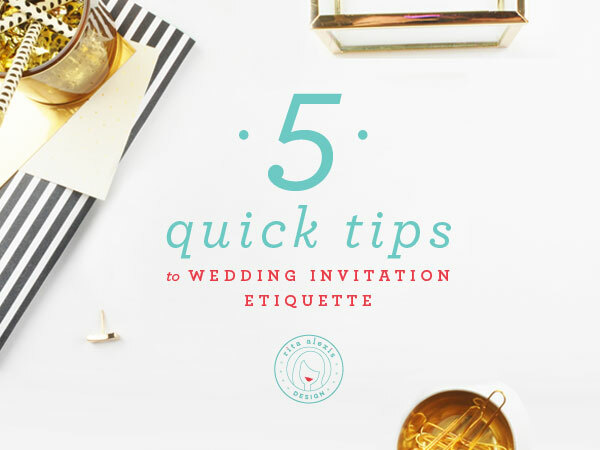 If you have no clue what I'm writing about, no worries, we won't get into it; however I'd love to help you understand what Wedding Invitation Etiquette is all about. When: List out time, date, month, year. "Followed by dinner + Recpetion" are acceptable, too. But as far as the actual invitation card go, that's pretty much it. Everything else will either go on detail cards or the website. When choosing who goes in what order, always place the bride-to-be first. It is customary to write out "Mr. + Mrs. DadName DadLastName request the honor of your presence at the marriage of their daughter..." If your style isn't traditional like that, you can always write it more relaxed, but keep in mind, if the parents are hosting, it is best to start with their names on the invitation. It's the least you can do for them shelling out all the dough, right? It is not mandatory you have all the information in the invitation like weather, attire, map, directions, accommodations; however, you know your guests best. If you think it will be helpful for them to have all of it in-hand, then by golly, do so! But if you think it suits your guests to reference it on your website, then program your little heart out. And it can look very beautiful to have all this written out. However, you might have a more modern or whimsical approach where you use all numbers 04.08.2016, and that's fine. I would just recommend keeping your style consistent. If you're going to be traditional, then be traditional everywhere. If you're going to be modern, be modern everywhere. Bottom line is, you want to make sure your guests are getting all of the proper information they need to (1) help you plan your wedding according (2) attend your wedding! Try to make it foolproof and totally you. Want this as a reminder/checklist? Download it here. Any other questions, just email me at hello@ritaalexisdesign.com.